Sharpen your skates and skills as Toronto’s number one outdoor winter party returns with another stellar lineup of local and international DJs that will surely bring the heat to your Saturday nights. 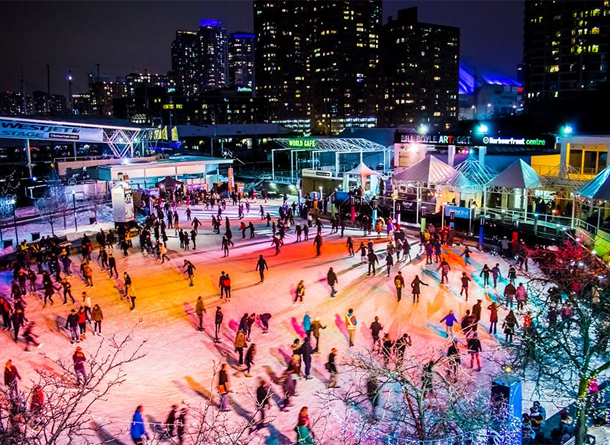 The rumours are true, DJ Skate Nights is the best party in town and a surefire cure for the winter blues! Join us on January 16 for a free event to hear emerging artists selected for the final round of Tafelmusik’s inaugural Vocal Competition. Nine finalists will perform live for judges and audience alike in a bid to be one of three performers joining soprano Dorethee Mields and Tafelmusik in Zelenka and Bach this spring. Come cast your vote for the Audience Choice winner! Hot blues on a cold night. Join blues fans and supporters from across the country for the annual all-star concert, awards event, and after party on Blue Monday, the darkest night of the year! The sell-out hit of the 2012 & 2014 Edinburgh Festivals and an acclaimed hit at festivals around the world, from one of Europe’s hottest theatre companies to explode out of Belgium, Bigmouth finally has its Canadian premiere. In a tour de force performance, Belgian actor Valentijn Dhaenens pays tribute to 2,500 years of oration. Ingeniously weaving together fragments of seminal speeches from not only the Grand Inquisitor and Socrates to Mohammed Ali and Osama Bin Laden, Bigmouth shows that the tricks of rhetoric have hardly changed. The magnificent, deeply human drama of Mozart’s Requiem is brought to life as a moving theatrical event, directed by Joel Ivany. This gripping semi-staged production casts in a whole new light the composer’s soul-stirring final, unfinished masterpiece. From Friday, January 29th to Sunday 31st, 2016, Rugby Canada will be hosting the inaugural National Rugby Conference to be held in Toronto, ON. Coaches, administrators, and leaders in the Canadian Rugby community will gain insight on specific rugby streams, connect with fellow rugby enthusiasts and get inspired to grow the game in Canada. The top rugby minds from across Canada and abroad will be invited to facilitate group discussions with representatives from across the country. Experience the splendour of the Edwardian era with the beloved tradition of High Tea at Toronto’s majestic castle, Casa Loma. Settle in, select your tea and savour the signature handmade miniatures while surrounded by live musical amusement. Enjoy the 18-ft. (5.5-metre) cake stand, the “world’s tallest” filled with thousands of fancy mini pastries. Enjoy plated signature tea sandwiches accompanied by a selection of teas. Let the charm of this premier attraction and historical castle melt away the winter blues! This is the perfect event for the entire family. Guest are invited to explore the castle and grounds. In snow, sleet, rain or shine, on January 31st, 2015 from 11-5 p.m., we will once again transform Roundhouse Park into a giant craft beer wonderland for brew lovers and food truck aficionados. It’s time for Canadians to haul out their toques, parkas, snow pants and balaclavas and do what we do best – take back winter. After all, we’re a nation that rocks at winter: In 1937 a Canadian invented the snowmobile, in 1925 a Canadian brought us the snowblower, Canada won the most gold medals at a single Winter Olympics, and without the cold would there even be ice hockey (yeah we invented that too #humblebrag) So bundle up and step out with pride for a winter party!